I have a super EASY and yummy recipe for you all today! This is my go-to recipe for days when I know we’re going to be busy running from one sport to the next! I originally found this one on the Tasty Kitchen blog, and since then I’ve seen several variations. I’ve tried a couple of them, and honestly I think the more simple the better. So, ready for the absolute easiest thing you’ve ever made? Here we go! Place thawed chicken into your slow cooker, and cover with 1 whole jar of salsa. Cook on high for 4-6 hours, or low for 7-8. About 6 hours in, use a fork to shred chicken and stir it around to coat in the salsa. Keep on warm until you are ready to serve! For tacos, I just put all of the toppings out in little bowls and let everyone make their own! You can also use this mixture for burritos, just wrap in tortillas, cover with green chili and bake 30 minutes @ 350 degrees. Top with cheese, sour cream, and guacamole! Place thawed chicken into your slow cooker, and cover with 1 whole jar of salsa. Cook on high for 4-6 hours, or low for 7-8. About 6 hours in, use a fork to shred chicken and stir it around to coat in the salsa. Keep on warm until you are ready to serve! Another idea is to use green enchilada sauce (tomatillo sauce) instead of salsa. Super easy and super yummy! I have done it with just breasts, just thighs, and a combo of both. Obviously better flavor with thighs but tasty with breasts because of all the other taco ingredients. You have to watch breasts because they will dry out. Looks great! Thanks for the yummy idea, Erica! I make this all the time, but I add a packet of taco seasoning in with the salsa. Super yummy!! I made this for dinner tonight and it got rave reviews – used 3 chicken breasts (they were big!) and 1 jar of salsa and it was perfect. 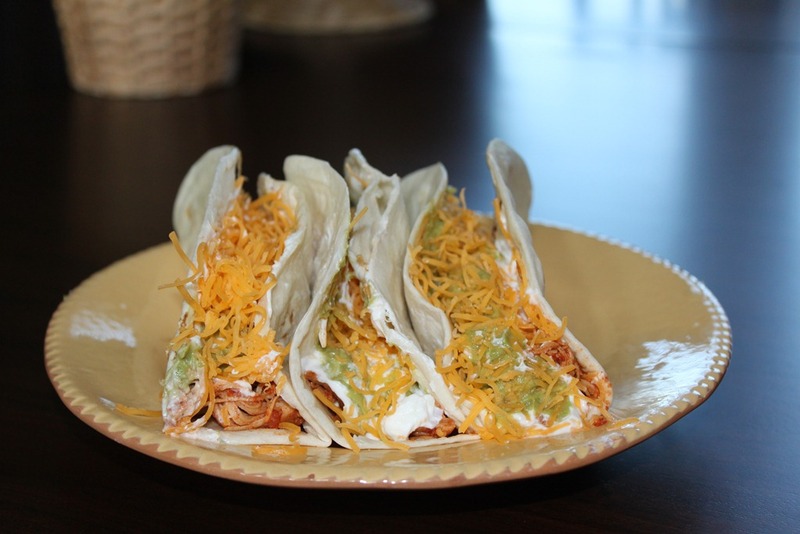 The breasts did not dry out – the salsa helps keep that from happening 🙂 Not only did my husband and i love them but my 3 year old ate two tacos and my 2 year old ate one taco – coming from two kids who hardly eat, that says alot! 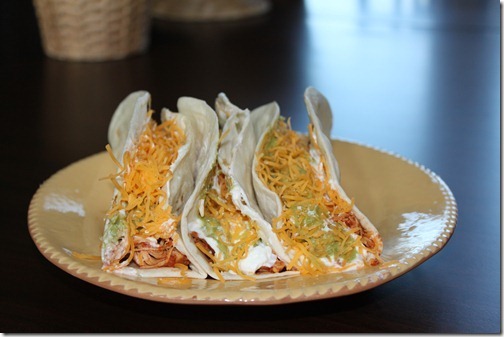 Thanks for sharing another great recipe – I have yet to try one of your recipes that has not become a family favorite!